Grilled shrimp loves almost all manner of whites and roses, but by pairing the wine with the accompanying sauce, you can really make a great match. Zesty Sauvignon Blanc has those slight green flavors that are terrific with herbs in sauces like salsa verde and pesto. These whites are also light enough to pair with shrimp in simple vinaigrettes or green salads. If shrimp are served with a spicy Asian-style dipping sauce, a slightly sweet Riesling is your best choice. The Riesling can also be great with fruit salsas, like mango. You can also try off-dry versions of Chenin Blanc (specifically those from Vouvray in France), which are richly textured whites that often have luscious fruit flavors. Lighter French-style rosés are a great catch-all wine for simple grilled shrimp preparations. You almost can’t go wrong. They’re also terrific with rich sauces, like aioli or compound butters. 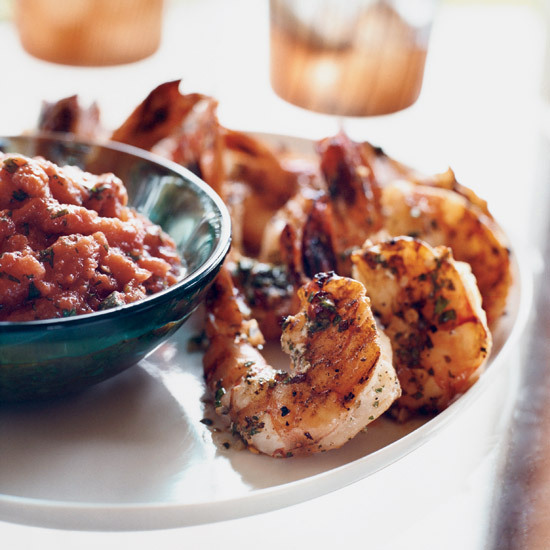 If your shrimp are bacon-wrapped or served with a rich, roasty type of sauce, like Spanish romesco, a slightly fuller bodied fruity rosé is just the thing. Kristin Donnelly is a former Food & Wine editor and author of the forthcoming The Modern Potluck (Clarkson Potter, 2016) and the blog Eat Better, Drink Better. She is also the co-founder of Stewart & Claire, an all-natural line of lip balms made in Brooklyn.